This is an interactive simulation created to help beginners differentiate velocity and acceleration vectors. The user can move a ball with the mouse or let the simulation move the ball in four modes of motion (two types of linear, simple harmonic, and circular). Two vectors are displayed -- one green and one blue. As the motion of the ball changes, the vectors also change. Which color represents velocity and which acceleration? Editor's Note: This simulation was designed with improvements based on research of student interaction with the PhET resource "Ladybug Revolution". 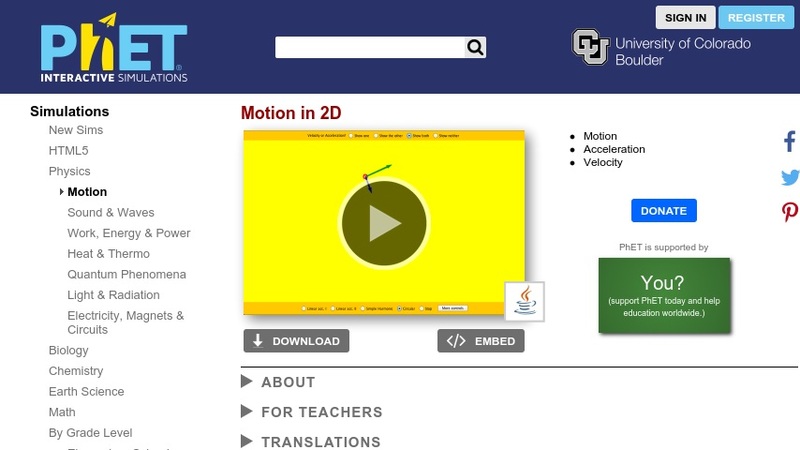 The authors added two new features for the beginning learner: linear acceleration and harmonic motion. To supplement the simulation, we recommend the Physics Classroom tutorial "Vectors and Direction" and the teacher-created lesson, "Vectors Phet Lab" -- see links in Related Materials. This item is part of a larger and growing collection of resources developed by the Physics Education Technology project (PhET), each designed to implement principles of physics education research.